Please be advised: Players from United Kingdom are not accepted at BoVegas Casino. Try one of the three casinos below, as they welcome UK players with great bonus offers! BoVegas went live in 2017 and has quickly turned into one of the top Australian-facing online casinos. The site is laid out with a user-friendly interface and features a vast library of games ranging from slots and video poker to classic table games and specialty games like bingo and keno. Large progressive jackpots and great bonuses have struck the right note with new Australian players. BoVegas is a licensed online casino that promises an enjoyable gambling experience in a safe and secure setting. There expansive library of games, which can be played on desktop or mobile devices, is categorized for easy access. An ever-present "24/7 Live Chat" icon at the bottom of the page reassures customers that the support staff is always ready to help you. BoVegas' instant play platform uses HTML5-based technology and is compatible with several desktop browsers and mobile devices. Customers need not download any software but apps are available for those who choose. Getting started is easy. Australians just need to go to the site using their desktop or mobile device to register a new account and play for free or real money. Registered customers can see BoVegas' library of games by clicking on the categories at the top of the page. They can also use the search function to find their favorite titles. The site is powered by Realtime Gaming who has been creating fun and provably fair games for over 20 years. A massive collection of 3-reel, 5-reel, and 6-reel slot games are found here on top of the bonus round slots and progressives. Customers can browse this section for their favorite table games, scratchcards, board games, shooting games, keno, and bingo. Players who want to go for the big prizes are drawn to this section which features a variety of progressive slots and progressive table games with massive jackpots. Popular card games like Blackjack, Caribbean Stud, Baccarat, and Let'Em Ride are just some of the classic casino card games that Australians love to play. Live dealer games give online players the most realistic casino experience complete with live chat and professional dealers. Video poker enthusiasts will love the selection of 1-hand, 3-hand, 10-hand, and even 52-hand video poker titles. BoVegas is optimized to work on mobile devices including Android, iOS, and tablets. The games automatically adjust to the user’s screen size without compromising user-friendliness or graphic quality. Australians who want to play on the go can either download the mobile app or simply tap on their favorite game to play instantly. Go to BoVegas Casino on your iOS, Android or tablet. Click the "Sign Up" button found on the top-right corner. Then check your email and click on the confirmation link. Go and make your first deposit. You are now ready to start playing. 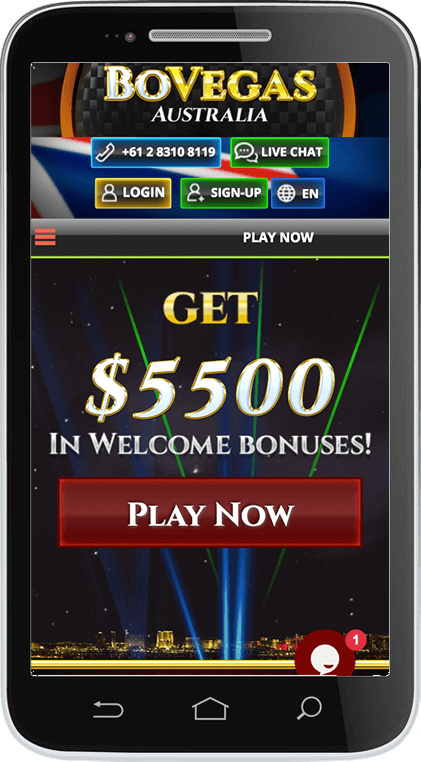 Players who use mobile devices have full access to the site and can register, claim bonuses, contact customer service, and make deposits or withdrawals. They can also join the VIP Club and earn comp points as they play on the go. BoVegas offers customers a variety of daily, weekly, and ongoing promotions and bonuses as well as cashback. Australians who want to take advantage of even more perks can join the VIP Club where they are eligible to receive cash bonuses, a VIP manager, and many other rewards. Daily Rewards: BoVegas runs a number of different daily promotions such as the 200% Match Bonus + 60 Free Spins promotion and the 250% Slots Match bonus. Customers can also get in on the 180% Slots Match + 50 Free Spins or the 250% Match Bonus. Most of these promotions require bonus codes so be sure to check out the promotions page regularly so you don’t miss out. Monthly Specials: Australians who appreciate added value love the monthly specials at BoVegas. Slot fans can earn up to $250 and 75 free spins on their deposits while those who like to play card games can earn an extra $150 in bonus cash. Like the daily rewards, these monthly specials usually require a bonus code which is located in the promotions page. Earn VIP Club Points: Players earn comp points every time the place a bet and these comp points are used to earn VIP Club status which comes with a bunch of other rewards. Comp points can also be redeemed for real cash. Weekly Cashback: VIP Club members are eligible to receive cashback on their losses. The amount is directly tied to your VIP Club status. Insurance on Losses: Customers can recoup a portion of their losses every month through the VIP Club’s Monthly Insurance plan. Loyalty Points: Earn loyalty points every time you place a bet. These points can be redeemed for cash. The VIP Club at BoVegas consists of four different tiers that each come with an assortment of valuable perks such as cash bonuses, personal account managers, and the power to earn higher comp point rates. Play Knight: The first VIP Club level entitles customers to a $75 status recognition chip, up to 15% weekly cashback, a personal VIP manager, exclusive cashback and match bonuses, and a $50 birthday bonus. Royal Elite: Players that reach this level will receive a $250 status recognition chip, up to 15% weekly cashback, exclusive slot tournaments, a dedicated VIP team, 5% monthly insurance on losses, a $100 cash birthday bonus, and personalized promotional offers. Imperial Pro Achieving this level entitles members to a $500 status recognition chip, up to 20% weekly cashback, higher cash outs, a VIP host, 7% monthly insurance on losses, special birthday bonuses and free plays, higher comp point rate, and access to exclusive tournaments. Vegas Legend: This is the highest and most prestigious level in the VIP Club. Members get a $1,000 status reward chip, up to 20% weekly cashback, higher cashout and bet limits, a personal VIP host, 10% monthly insurance on losses, valuable birthday bonuses and high roller rewards, and exclusive tournaments with the highest prize pools. All deposit methods are instant and require a minimum deposit of $25. Customers using American Express, Visa or MasterCard can deposit up to $1,000. Bitcoin deposits are unlimited. Those wanting to withdraw using a bank transfer will need to provide customer service with their bank’s SWIFT code. Withdrawals must be between $100 and $2,000 and there is a $2,000 weekly limit on withdrawals. However, VIP Club members may be eligible for higher withdrawal limits. BoVegas does not charge any fees for deposits or withdrawals but some payment processors do. Check with your payment processor to find out if any fees apply to your transactions. Live Chat: You can instantly connect with the support team by clicking on the ever-present “24/7 Live Chat” button in the bottom-right corner of the main page. Telephonic Support: Australians can get in touch with the support team at any time by dialing toll-free +61 2 8310 8119. Email: Any questions can be directed to the customer support team by emailing them at support@bovegas.com. You won’t have to wait very long to get a polite, helpful, and detailed reply. Our dedicated team of experts have closely examined BoVegas Casino. They opened accounts, deposited money, and claimed bonuses. They also interacted with the customer support team and other players on the site. Aside from the limited banking options, no other complaints about the casino were apparent. Australian players who want to enjoy a well-rounded online casino experience on their desktop or mobile device will be more than satisfied with what BoVegas Casino has to offer. They will definitely appreciate the selection of games, the great bonuses, and the professional customer support staff that is available 24/7.